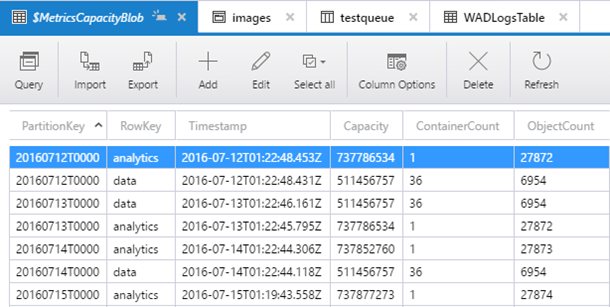 One year ago we released the very first version of Microsoft Azure Storage Explorer. At the beginning we only supported blobs on Mac OS and Windows. Since then, we've added the ability to interact with queues, tables and file shares. We started shipping for Linux and we've kept adding features to support the capabilities of Storage Accounts. In this post, we first want to thank our users for your amazing support! We appreciate all the feedback we get: your praise encourages us, your frustrations give us problems to solve, and your suggestions help steer us in the right direction. The developers behind Storage Explorer and I have been using this feedback to implement features based on what you liked, what needed improvement, and what you felt was missing in the product. Today, we'll elaborate on these features, including what's new in the November update (0.8.6) and what we've shipped since our last post. For this release we focused on the features that most help with productivity when working across multiple Storage Accounts and services. With this in mind we implemented quick access to resources, the ability to open multiple services in tabs, and vastly improved the upload and download speeds of blobs. The top of the tree view now contains a "Quick Access" section, which displays resources you want to access frequently. 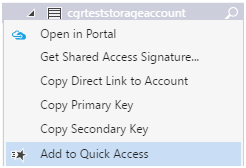 You can add any Storage Accounts, blob containers, queues, tables, or file shares to the Quick Access list. To add resources to this list, right-click on the resource you want to access and select "Add to Quick Access". This has long been requested in feedback, so we're pleased to share you can now have multiple tabs! You can open any blob container, queue, table, or file share in a tab by double-clicking it. Single-clicking on a resource will open it in a temporary tab, the contents of which change depending on which service you have single-clicked on the left-hand tree view. You can make the temporary tab permanent by clicking on the tab name. This emulates patterns set by Visual Studio Code. On the performance front, we've made major improvements to the upload and download speeds of blobs. The new speeds are approximately 10x faster than our previous releases. This improvement primarily impacts large files such as VHDs, but also benefits the upload and download of multiple files. Before this release, you could only see the properties of a specific file or blob. With this release you'll have the ability to modify the value of editable properties, such as cache control or content type. You can right-click on the blob or file to see and edit their properties. We've also added support for creating empty "virtual" folders in blob containers. Now you can create folders before uploading any blobs to it, rather than only being able to create them in the "Upload blob" dialog. 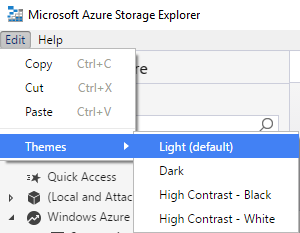 We also improved usability by adding support for themes in Storage Explorer. There are four themes available: light (default), dark, and two high-contrast themes. You can change the theme by going to the Edit menu and selecting "Themes." Lastly, we fixed a screen freeze issue that had been impacting Storage Explorer when starting the app or using the Windows + arrow keys to move it around the screen. Based on our testing we believe this issue is fully fixed, but if you run into it please do let us know. After completing support for the full set of Storage services, we pivoted on improving the experience for connecting to your Storage Accounts and managing their content. This allowed us to open up our backlog to work on the major features we shipped in November. One of the main areas we wanted to improve was the display of Storage Accounts in the left-hand tree view. The tree now shows Storage Accounts grouped by subscription, as well as a separate section for non-subscription resources. This "(Local and Attached)" section lists the local development storage (on Windows) and any Storage Accounts you've attached via either account name and key or SAS URI. It also contains a "SAS-Attached Services" node, which displays all services (such as blob containers) that you've added with SAS . If you're behind a firewall, you've likely had issues with signing into Storage Explorer. To help mitigate this, we've added the ability to specify proxy settings. 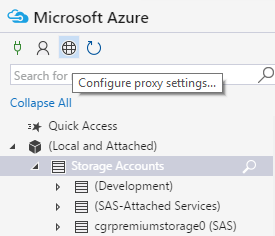 To modify Storage Explorer proxy settings, you can select the "Configure proxy settings…" icon in the left-side toolbar. Lastly, we've also modified the experience when you first sign-in so that all the subscriptions you have under the Azure account are displayed. You can modify this behavior in the account settings pane either by filtering subscriptions under an account, or by selecting the "Remove" button to completely sign-off from an account. In the summer months we also added the ability to copy and rename blob containers, queues, tables, and file shares. You can also copy and rename blobs, blob folders, files, and file directories. To copy and rename, we first create a copy of all the resources selected and move them if necessary. In the case of a rename, we delete the original files once the copy operation is completed successfully. It's possible to copy within an account as well as from one storage account to another, regardless of how you're connected to it. The copy is done on the server-side, so it's a fast operation that does not require disk space on your machine. We've also improved the way to manage the access and rules of your storage resources. At the storage account level, you can now add, edit, and delete CORS rules for each of the services. You can do this by right-clicking on the node for either blob containers, queues, tables, or file shares, and selecting the "Configure CORS Settings…" option. 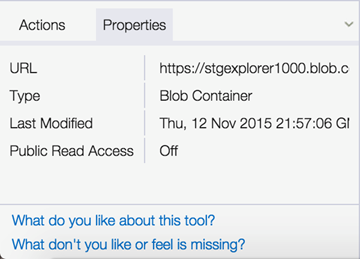 You can also control the actions you can take on blobs by creating and breaking leases for blobs and blob containers. 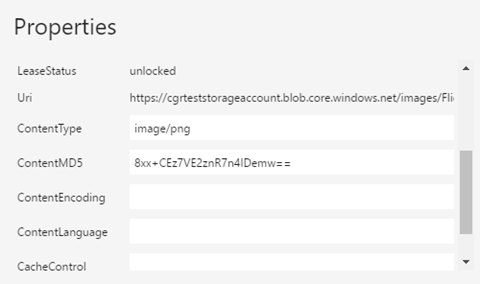 Blobs with leases will be marked by a "lock" icon beside the blob, while blob containers with leases will have the word "(Locked)" displayed next to the blob container name. To manage leases, you can right-click on the resource for which you want to break or acquire a lease. We also added the ability to share direct links to the resources in your subscription. This allows another person (who also has access to your subscription) to click on a link that will open up Storage Explorer and navigate to the specific resource you shared. To share a direct link, right-click on the Storage Account or blob container, queue, table, or file share you want the other person to access and select "Get Direct Link…." Lastly, we made significant improvements to the table querying functionality. The new query builder interface allows you to easily query your tables without having to know ODATA. With this query builder you can create AND/OR statements and group them together to search for any field in your table. You still can switch to the ODATA mode by selecting the "Text Editor" button at the top of the query toolbar. Additionally, you have the ability to save and load any queries you have created, regardless of whether you use the builder or the editor to construct your queries. Although we've done a lot of big features, we know there's still gaps. Blob snapshots, stats and counts about the contents of your services, and support for Azure Stack are among the features for which we've heard a lot of requests. If you notice anything missing form that list or have any other comments, issues, or suggestions, you can send us feedback directly from Storage Explorer. Thanks for making our first year a fantastic one!